The year 2009 brought about a seismic shift to the Teenage Mutant Ninja Turtles: after twenty-five years as a mom-and-pop property–albeit a ridiculously successful one–the intellectual property was sold to Viacom, and more specifically Nickelodeon, an entity that would not, and did not, waste any time capitalizing upon it. Only an entity like Nick could have been able to take a cartoon series that lasted six years and almost a hundred and fifty episodes and make it seem like a footnote in TMNT history, but that’s precisely what happened; with the turtles once again in comic book stores, tv screens and movie theaters, the last few years have been like 1991 all over again. However, this is not, in fact, 1991, a time when Eastman and Laird were willing, if not always happy, to let almost anyone play with their toys: Nickelodeon appears to keep the turtles on a much shorter leash. Even when characters like Karai get radically reinvented, it feels like a boundary exists; the turtles must not pass this point. They can’t be radical, just Radical (TM). Therefore it is not surprising to see that April is once again and three times over, a white woman. More interesting for the purposes of this series is the fact that IDW Publishing’s license to create and publish TMNT books gave them the ability to reprint the old Mirage and Archie material, and that the company has thus been making books that were out of print for decades available once again. More interesting still, the reprinted Mirage material, much of it originally in black and white, is being recolored, meaning that various colorists have been tasked with looking at the various looks of April O’Neil and drawing conclusions about just what it was the original creators intended, and deciding whether or not they’ll stick to that original intent. So yeah, lots to cover here. One note before we begin, though: these images are organized in more or less chronological order, and while that’s easy enough to establish with the books, I’ve had to rely on some educated guesswork when it comes to the images relating to the cartoon and film. So there’s that. The second cycle of Robotech, known as The Robotech Masters, The Masters Saga or simply The Masters, is often considered the black sheep of the series, and it’s not hard to see why: it takes longer to find its footing; its character and mecha designs don’t have the immediate appeal of Macross or MOSPEADA‘s; and the conflicts between the script and the footage are far more pronounced, since Super Dimension Cavalry Southern Cross‘ overall scenario–about the two-mooned planet Glorie, which was immigrated to and terraformed after Earth became uninhabitable, and which is now being attacked by its previous inhabitants–had to be changed completely for it to fit Robotech. Things like the nature of the antagonists and what the characters are supposed to know change from episode to episode; footage is rearranged in ways that contradict the established continuity (particularly in the first episode, a clip show made from scratch to tie the cycle with the one that preceded it), and in short, it just doesn’t make that sense a lot of the time. Still, it’s not hard to see why it was chosen as a follow-up for Macross, despite everything. 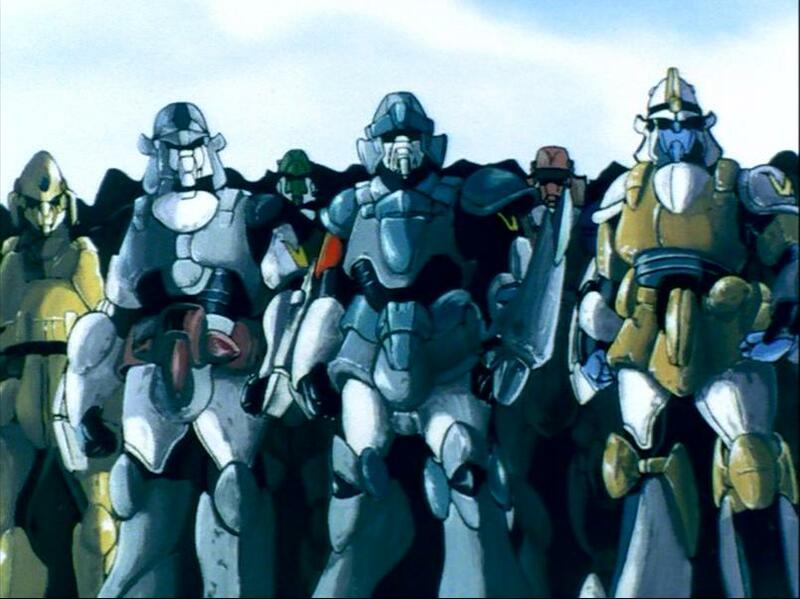 It turns Robotech into a story that is not only multi-generational—The Masters stars the children of the first Robotech warriors–but cyclical, as events repeat themselves and allow for a deeper thematic exploration than was available in the original Japanese material. Here we once again have romance between earthlings and aliens, unity through music, bellicose leaders whose belief that hard power is the only worthwhile power ends badly for them, and the near destruction human civilization, in ways that are interesting in their own right. They suggest that even with The Macross Saga’s hopeful ending, humanity is still humanity, and happy endings are something you can only find after spending time digging in the rubble after the smoke clears. Fifteen years after the SDF-1’s destruction at the end of The Macross Saga, Earth is still under the rule of a military government– specifically, the Army of the Southern Cross (ASC), under control of Supreme Commander Anatole Eli Leonard. 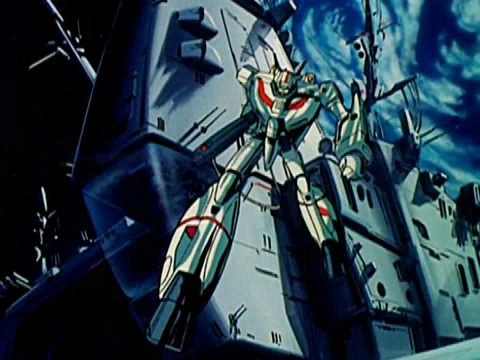 The heroes of the First Robotech War have long since left Earth as part of a diplomatic mission in an attempt to forestall future conflict, which means that they aren’t available when the Robotech Masters arrive, ready to retrieve the Protoculture Matrix which they need in order to replenish their own dwindling supplies of the power source and keep their civilization going. While The Macross Saga was as much about the civilians as it was about the soldiers, this one is all about the latter. Our three protagonists all occupy positions in the armed forces, and in fact, the only civilians we properly meet are all part of the attacking alien fleet—a reversal of the previous arc’s dynamic. First and foremost is Dana Sterling, half-human/half-Zentraedi daughter of The Macross Saga‘s Max and Miriya Sterling, who leads the 15th Squadron of the ASC’s Alpha Tactical Armored Corps. Cheerful, optimistic, and only vaguely acquainted with any concept of military discipline, she is a pain in her superior’s asses, a fact which she makes up for by being a crack hovertank pilot and a capable leader. Attempting to keep Dana in line is GMP (“Global Military Police”–The Masters is awash in initialism) officer Nova Satori, whose basic competence would perhaps be more evident in a story in which she wasn’t set out as a foil, but whom I really like anyway. Rounding up the triumvirate is ace pilot Marie Crystal, unit leader at the ASC’s Tactics Armored Space Corps, whose role is to give a face to the numerous space battles and to provide Dana with a friendly rival. Note: For the uninitiated, here’s a quick and dirty (and severely abriged) Macross-to-Robotech dictionary. Japanese terms to the left, with Harmony Gold’s names at the right . In case it wasn’t obvious from my previous post on the subject, I’ve been thinking a lot about Robotech lately, rewatching the entire series on DVD and consuming whatever additional material the internet machine can provide, including material from its source material. Among that is Macross Flashback 2012, the charming OVA featuring Lynn Minmay’s final concert before her departure from Earth in the SDF-2 Megaroad 01. It’s cheery and optimistic, and it presents some interesting contrasts between the approaches Tatsunoko/Studio Nue and Harmony Gold’s took to the character. While Macross and Robotech both tell the same basic story, the come at it from different places, and both take different things from it. 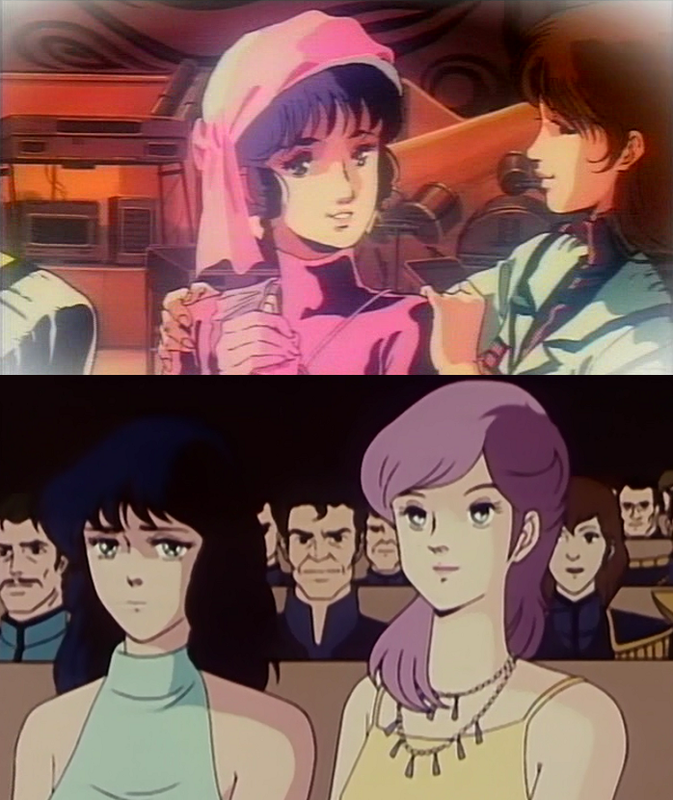 While determining these differences presents some difficulties when they both share the same footage (although not impossible—see “protoculture”) it becomes a bit clearer when you look at what each company produced afterwards, particularly as they relate to the character of Minmei. For the bulk of both series, Minmei is characterized is the brave, cheerful, inspiring woman whose spirit proves to be greatest single factor in the transformation of the SDF-1’s civilian population from a collection of refugees to a vibrant community, and whose fame helps bridge civilizations and end the war between the human and the Zentraedi. Without firing a single shot, Minmei became as great a war hero as Max Sterling, Lisa Hayes, or Henry Gloval.